They were later brought home by the driver about 12am. By then it was clear I couldn’t leave again, I had to spend the night. The following morning, I bathed and dressed them for school. They pleaded with me to stay back until they returned and since I hardly spent time with them the day before, I agreed. Examination revealed a middle aged woman in distress with multiple bruises, BP 140/80mmhg and pulse rate 104bpm. There was inflammation around the left knee and tenderness along the spine. She was subsequently admitted, placed on intravenous fluids and managed as case of multiple trauma secondary to domestic violence. Bessem has made all sorts of allegations against her husband, but what she has failed to tell you is that she left her marriage of her own volition. She ended her marriage with her infidelity. She would leave her house, come back at late hours and would not tell her husband where she has been. The couple are already in court for divorce. 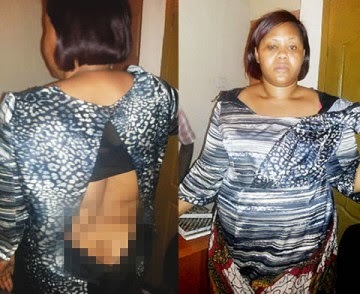 This particular incident you are asking about, it was Bessem who tore her own clothes. Chris never laid a hand on her. Why did she not get a medical report from a government hospital? If she was truly assaulted she would have gone to the station to make a report. Then they would give her a paper to take to a public hospital. That of the private hospital is not admissible in court. Chris never refused her access to her children; they were simply brought to the church because his mother and cousin were not at home. After bringing some policemen from Isheri to arrest Chris while he was at the pulpit, she still went ahead to Zone 2 to make another report. The PPRO Zone 2, SP Lewi Suleimann, when contacted said, We are still waiting to get the file transferred from the Isheri Police Station. I would not like to comment much before we get the file. This entry was posted in General Emotions for singles, dating, married, Divorced, Men, News, Relationships, Women and tagged Estranged Wife Says, Mountain Of Fire Pastor Beats and Drags Ex-Wife Out Of The House.